If you are a creative in Grenada (or the wider Caribbean) and you have excused yourself or your work because you are young, lack cutting edge technology or because you live in Grenada — Teddy Frederick has revoked your excuses. On the evening of 2 December, Frederick opened his show, “Floatography” at the Grenada National Museum. Along with the elevated content of his work, Teddy has elevated the standard and expectations of young artists in Grenada. While his work contains compelling illusions, what really comes through is the attention to detail and the commitment to a narrative that Teddy infuses into his work. 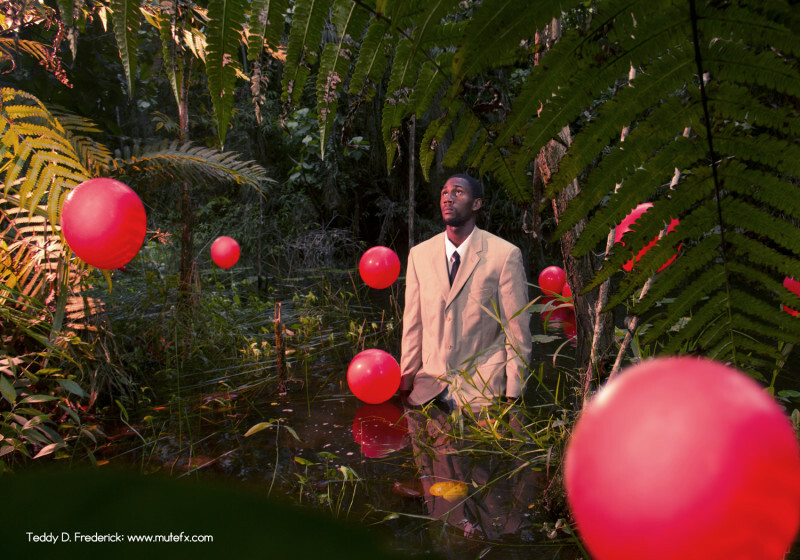 Reminiscent of award winning Nigerian photographer and installation artist, Yinka Shonibare, Teddy represents a decidedly new voice amongst Grenadian artists. Walking into the exhibition space at the museum, the viewers’ eyes are pulled up to the large format photographs suspended from the ceiling. The viewers’ eyes are kept there through the composition, narrative and technical mischief that Frederick creates. The layers of content in his work, like varying textures, cause us to run our eyes over the piece one last time like we would our fingers over a mysterious found object. We try to imagine what the story is behind each character in the visual narrative. We become darkroom detectives and try to decipher his photographic methods as if it was a crime scene. We empathize with the levitating women, men, and children and quietly suspect that we too, may have floated before as well. In Teddy’s opening comments he spoke to the prevalent reliance on technology by many contemporary artists. It is easy to use technology as a crutch and for artists to make work that is technologically interesting but lacking substance. “Technology, at this point, does not define our art. Our ability to communicate our ideas and stories effectively defines our art.” Along the same train of thought Teddy addressed how he answers people regarding which camera to use or what technology they need to make good art: “The best camera to use is the camera you have.” The longing artist, waiting for their new camera or new brushes to make good work are plentiful. The artist without excuses is the artist that will be recognized. Teddy Frederick through “Floatography” deserves recognition. 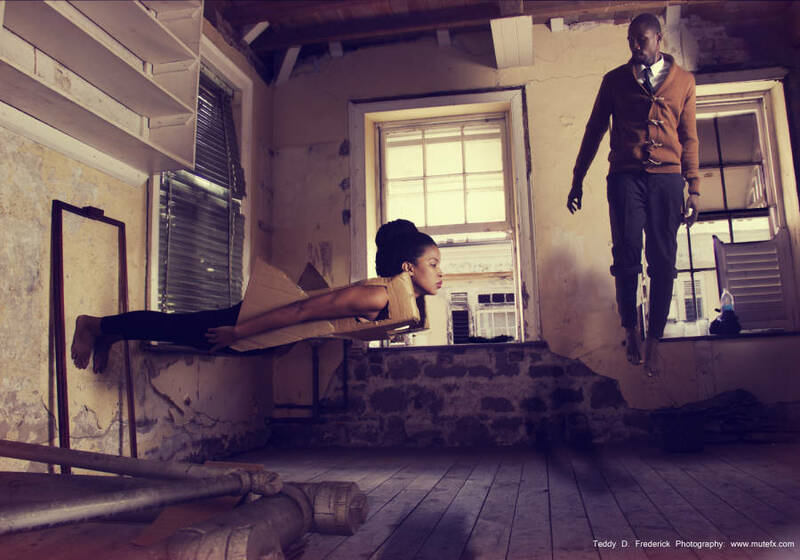 Teddy Frederick through his creative and inventive photography and use of resources has revoked all of our excuses. The exhibition continues at the Grenada National Museum on Young Street, St. Georges, through 17 December. Open from 10 am to 5 pm, admission is free, and donations are appreciated.